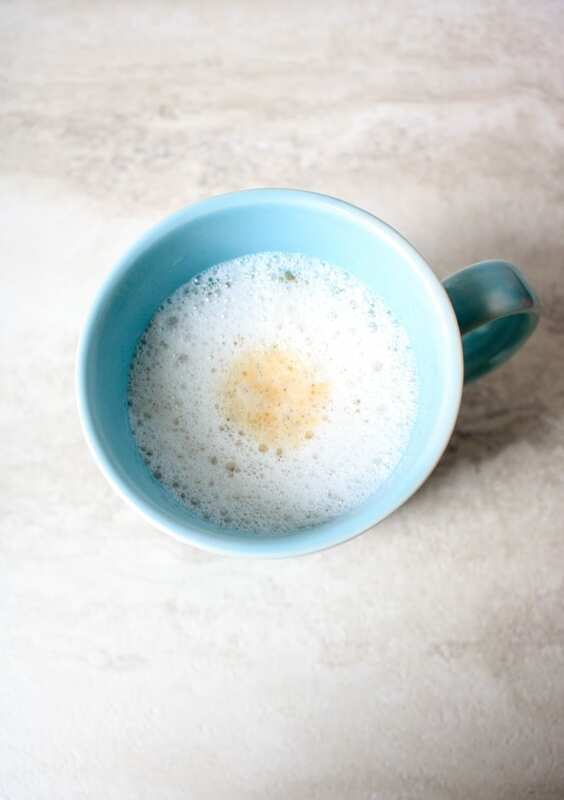 2 Ingredient DIY Latte: No Fancy Equipment Required–Skip the expensive chain’s lattes and make your own latte at home! This easy recipe will show you step by step how to make a latte. Dairy Free, Vegan, and Paleo adaptations. Do you want to know the key to my heart? A good latte and a few new cooking magazines. To me, I consider it pure bliss to sit curled up and slowly sip on my latte while dreaming up new recipes. Throw in a piece of dark chocolate and I am in a little bit of heaven. I am pretty easy to please, aren’t I? That probably is NOT your definition of bliss. But I am willing to bet a large percentage of you reading this right now, will agree that a good cup of coffee is hard to beat. In fact, for most of us, myself included, that cup of joe is not only a desire, but has become most definitely a NEED to function most days. While I would love to hit up a drive-thru of a fancy coffee shop everyday, my wallet will NOT allow that, nor will my frugal nature. So I reserve visits to coffee shops to just special occasions. But that does not mean that I reserve special coffee for special occasions! No way!! I start each and everyday with a Homemade Latte. There are only two essential ingredients to a good latte and you only need one simple kitchen tool to make a perfectly frothy latte. That’s right–fancy equipment is necessary! Heat the milk for 30-45 seconds in your microwave in the cup you intend to drink your coffee from. Once the milk of your choice is heated, take a small whisk and vigorously whisk back and forth for 15-30 seconds until the milk is frothy. Pour your coffee over your frothed milk or brew from your k-cup right into the mug. Then take a seat and enjoy a small pleasure in life. For a dairy-free/vegan latte, use non-dairy milk such as almond milk, coconut milk, or soy milk. I prefer plain lattes. However, many people prefer flavored lattes. Sweetened Latte–add 1-2 teaspoons your choice of sweetener to your milk of choice BEFORE heating milk. Vanilla Latte–add 1/4 teaspoon vanilla extract to milk before after heating milk but before you add coffee. Chocolate Latte–add 1-2 tablespoons chocolate syrup to milk BEFORE heating milk. A super simple recipe for a homemade latte using no special equipment. Heat the milk for 30-45 seconds in your microwave in the cup you intend to drink your coffee from. Once the milk of your choice is heated, take a small whisk and vigoursly whisk back and forth for 15-30 seconds until the milk is frothy. Pour the coffee directly over the frothed milk or brew over it. Love your quick Latte recipe and make it all the time ! YAY!!! I am drinking one right now myself! 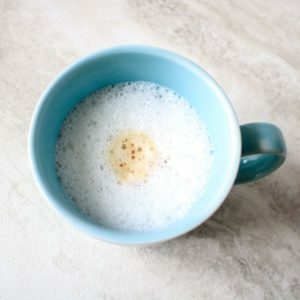 I love how simple this latte is to make! Most people never realize how easy it is to make! That is delicious and a great thought! I am allergic to the sprayed whipped cream, but great for any one who is not. I have been missing my Pumpkin Spice Latte. So, decided to make one this evening. Mmm… it hit the spot. Thank you for your post.